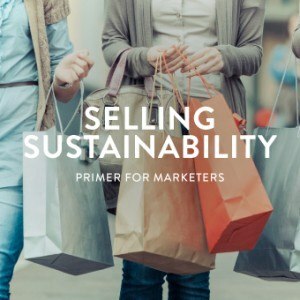 At Futerra we recently co-published a guide with BSR for Selling Sustainability, offering a framework for marketers struggling with the challenge of making sustainability desirable. That’s nice and all. But as Raz Godelnik recently asked in a post on TriplePundit, is this the answer? Let’s see. People want better lives and a better world. We can positively say this, whether we believe attitude surveys or not. And sustainability practitioners often believe they have the answer: greener, cleaner, safer and all that jazz. Here is the crux. This answer isn’t giving people what they want. For decades sustainability has been sold on better for planet, for people and for close-to-extinction tree frogs. The problem: The only ones to listen are the already converted (Futerrans included of course). Because the masses want better lives for themselves and a better world that they can experience: value to them, not to the tree frogs. The good news is that this can align with sustainability. The benefits aren’t mutually exclusive. But it all hinges on telling a great story. Solar power can save you money and give you independence. Organic food is safer for your children. And a driving a Tesla makes you look pretty damn cool. Our proposition is that marketers can help make sustainability so desirable that everyone wants a piece of it, not just the usual suspects perusing the aisles of organic health food stores. Now Raz suggest the troubles don’t end here. His analysis: If marketers truly want to sell sustainability, they need to think about how they can design a new culture and change the environment in which we live. Let’s try adding in some nuance. Products and messages play a big part of cultural context in which we live. Think about the smartphone and how it has transformed social interaction. Or how creative digital marketing has changed the way we view entertainment. Eighty-three million views of Nike’s Last Game video is testimony to this. Now imagine more products and messages fronting sustainability that is actually desirable: more Teslas and more Ella’s Kitchen -- things that raise people’s expectations and gets them asking for more and better. That’s a pretty good start to create cultural change. So, is it enough? Well. Re-designing culture is a massive societal project. It’s a multiplayer game that happens over time. Governments, citizens and companies need to create attractive representations of sustainability that lead to social roles and institutions to support said representations. So, this whole project probably needs some direction, some fuel and a vision of what this better world looks like. Like victor Hugo said, "There is nothing like a dream to create the future." What Selling Sustainability can do is offer a pragmatic tool for companies to help make sustainability so desirable it becomes a new normal. But without a bolder and braver dream of what better is, our electrical cars might all get lost in the mud. So, we would love for you to let us know what you think a better world looks like, and the type of stuff you think belongs there. Let’s create both the dream and the tools that will make it reality. Tell us about your dream of a better future on Twitter at @Futerra. Natasha Perkins is a brand strategist for Futerra.